Elected by Congress, the Executive Committee is in charge of the day to day business of the organisation. Its current seven members meet on a monthly basis and represent EuroCOP towards the outside world. They are also tasked with preparing EuroCOP Committee meetings and Congresses. The Executive Committee is composed of the President, a first and a second Vice-President, a Treasurer and three further members. Deputy General Secretary of the Catalan Police union: Sindicat de Policies de Catalunya. From Barcelona, Catalonia, Spain. Has been with the police since 1992. EuroCOP is a key organization where police across Europe can denounce the precarious situation in which many police officers find themselves. Most police officers must work and serve the citizens without adequate resources. I want politicians to be committed to the police. Police officers risk their lives every day on the streets to protect citizens. In exchange, they should be offered adequate labour conditions, decent wages to support their families and, of course, the necessary resources to serve citizens as they deserve. Roger Mercatoris was elected on the Executive Committee in October 2013. Roger is a criminal Police officer within the Belgian Police. He has been a police officer for 36 years. Rogers working places are Brussels, Germany (Neheim-Hüsten and Cologne), Athus and with EuroCOP Luxemburg also added to the list. Currently he is the provincial secretary of the SLFP-Police Belgium for the province of Luxembourg. The most important task for Roger as a police officer is to protect and defend the rights of all the people. “Being a Police Union representative means working on better working conditions for all the police officers” Roger says. Calum Steele was elected as General Secretary of the Scottish Police Federation (SPF) in 2008. In addition to representing the interests of all ranks below superintendent, Calum is also the lead negotiator for pay and conditions for all of Scotland’s police officers. Calum has 23 years police service and was privileged to serve in some of the most beautiful and remote parts of Scotland before taking up a full time position with the SPF. Calum is also the General Secretary of the International Council of Police Representative Associations (ICPRA) which brings together police and law enforcement unions and associations from across the world, collectively representing approx. 1.5 million police officers and has spoken at a number of policing events across the world. 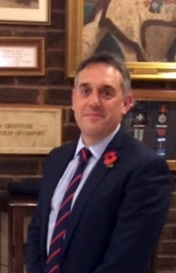 Mark has been a serving UK Police Officer with the Civil Nuclear Constabulary since 1992, Being elected as Chairman of the Civil Nuclear Police Federation (CNPF) in 2012 and is now in his second term. Having previously been an Auditor for two years, Mark was elected in 2015 as treasurer for EuroCOP. Georgios Stamatakis was elected as a member of the Executive Committee of EuroCOP in 2015 being the first Greek Police officer occupying a European police union office. Georgios has been a police officer for 20 years. He currently serves at the Directorate division of Security for West Attiki, dealing with public safety ,the preservation of State security and constitution and also conducting undercover investigations. In 2013, Georgios became a Board member of the newly formed Union of ‘Police Officers for the west region of Attiki, as well as a representative of the Panhellenic Federation of Police Officers. He was elected as General Secretary of the Union of Police Officers in the west region of Attiki in 2013. Milan joined the Czechoslowak police in 1986. Finishing the training school, he worked as a patrolling officer in Prague and then in Náchod. In 1990, he became a circuit criminal investigator in Náchod and then promoted to regional level in Hradec Králové investigating economic criminality. He graduated from Prague and Bratislava Police Academy.His membership in the Independent Czech Police Trade Union dates back to 1991 (the trade union itself was established in 1990) and between 2002 and 2005, he was its Local organization Chairman in Náchod. Since 2005, he has been consecutively elected the Union´s Chairman three times. He is a Vice-Chairman of the Managing Board of the Police and Firemen Foundation which takes care of widows and orphans after Czech policemen and firemen who died on duty. Milan occupied the position of the EuroCOP´s auditor from 4th November 2007 till 30th October 2013 when he was elected a Member of its Executive Committee.